For us, the “Beginning” is our relationship with our corporate customers, big and small. With roots that span 25 years in business, we have never lost a customer, and that is a testament to the attention and success we bring to each of our clients. The “Between” showcases our ability to add value to our customers, throughout a product’s lifecycle, and throughout the supply chain. The “End” is where our Cycle of Add Value Support proves our commitment to serving our customers’ customer. We rely on the voice of our customers to drive our intellectual team to improve systems and develop new solutions. 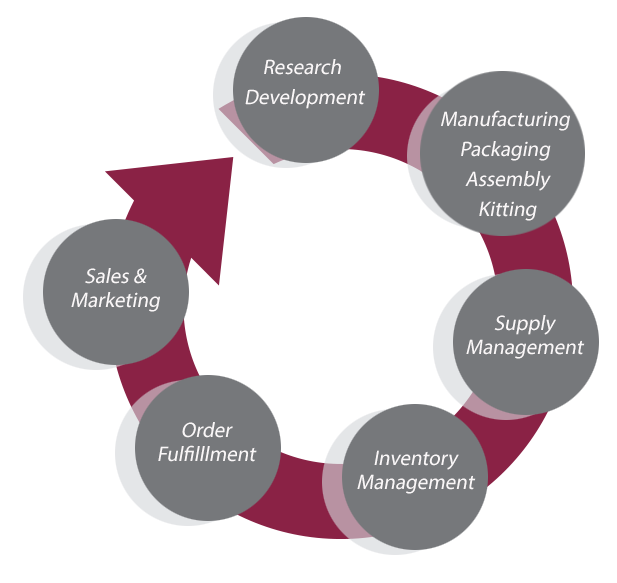 We provide least-cost production and packaging to allow for maximum profitability. With over 800 supply relationships domestically and globally, we offer a diverse portfolio of product solutions. Our systems are custom-designed to maximize efficiency, visibility, and assessment, while minimizing risk and cost. We offer a diversity of capabilities, including focused solutions, scorecard monitoring, flexible returns, and freight studies. Our Sales & Marketing team brings a wealth of experience to support and bolster our customers’ initiatives.